Last year, Israeli Prime Minister Benjamin Netanyahu admitted that Tel Aviv develop “secret contacts” with Saudi Arabia despite the fact that the two countries have no diplomatic relations. 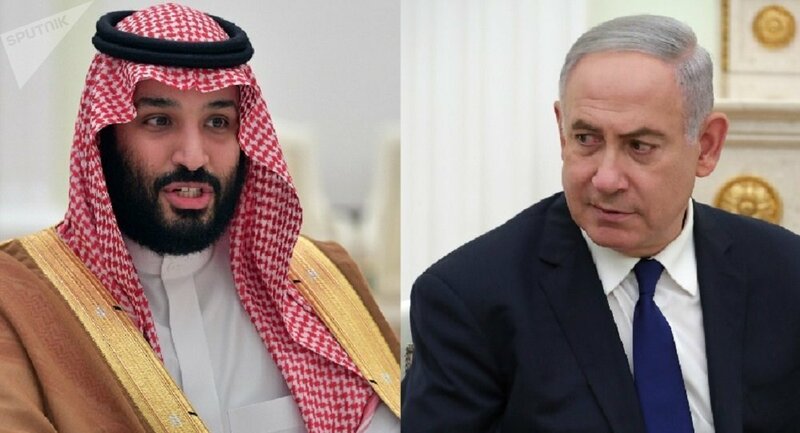 Saudi Arabia’s Crown Prince Mohammed bin Salman and Israel’s Prime Minister Benjamin Netanyahu had held secret talks in the Jordanian capital Amman, according to the Israeli newspaper Maariv. The negotiations were reportedly held on the sidelines of a visit to Amman by White House special adviser Jared Kushner and US Middle East envoy Jason Greenblatt. Earlier, Haaretz reported that Netanyahu secretly met Jordan’s King Abdullah II in Amman, where they discussed regional developments and the strengthening of bilateral economic ties. The same month, Israel Defense Forces Chief of Staff Gadi Eisenkot revealed that his country was ready to share intelligence with Riyadh in order to “face Iran.”With Riyadh rejecting allegations about bolstering its relations with Tel Aviv, Saudi Crown Prince Mohammed bin Salman recognized Israel’s right to exist earlier this year. The reported thaw comes amid escalated tensions between Iran, considered a threat by Israel and Saudi Arabia, which cut off diplomatic ties with Tehran in January 2016 following protests in front of its diplomatic premises in Tehran and Mashhad. Any relief for the people suffering in Gaza will have to come from outside the UN, so long as the US has veto power on the Security Council. As during the Vietnam War, the Council is deadlocked by the US veto. The UN was created to protect the sovereignty of its member states and organize a multilateral, conceivably military response to violations of any member state’s sovereignty, but Palestine has never been allowed to become a sovereign member state, and the US uses its military dominance to trample all over the UN Charter anyway. Who’s going to provoke the 800-pound gorilla in the room? If I were to go on about Israel’s criminal cruelty in Gaza, AHT readers would no doubt stop reading, because we know all this, as do readers of other marginalized left media in the US. We also know, as Joe Lauria writes in Consortium News, that the U.S. Media Whitewashes Gaza Massacre[s], if it even covers them at all. Gaza has been the top story in left and/or antiwar outlets since the latest massacre, but the silence of the US corporate press is barely broken by anything but editorials blaming Gazans or Hamas. The Canadian, European, and even Israeli press seem less locked down, but will European nations do anything to upset their own Zionist lobbies? For weeks most of the headlines including the name of British Labor Leader Jeremy Corbyn were about the latest person alleging he’s an anti-Semite. WHAT IS NEXT FOR PALESTINIANS AFTER NON-VIOLENT RESISTANCE HAS BEEN IGNORED? UN Ambassador Nikki Haley has already vetoed a UN Security Council resolution calling for another investigation, even though such an investigation would be no more than another gesture because the US would veto any action proposed. The government of Kuwait has called for a UN peacekeeping force to protect civilians in Gaza, but no such force could be organized in a way that would satisfy both Israel and Gaza, and if Israel didn’t welcome it, it would never get past the US veto. In “No HoldsBarred: Rwandan Troops Arethe Solutionfor Gaza,” one of Rabbi Shmuley Boteach’s more delirious essays in The Jerusalem Post, he suggested that Rwandan troops are best suited to serve as peacekeepers in Gaza because Rwanda suffered a genocide like the European Holocaust and would therefore be prepared to protect Israelis from Palestinians. You can’t make this stuff up. The Rwandan massacres were not like the European Holocaust anyway—not a one-sided state bureaucracy subjugating, confining, and exterminating minority groups. In Rwanda, Hutu and Tutsi attacked each other, and the US and UK were pursuing their own geostrategy in the background. However, Israel finds advantage in equating the two and sharing the genocide trademark with Rwanda’s military dictatorship. There are few imaginable solutions beyond the Boycott, Divestment and Sanctions Movement, which hasn’t managed to rein in Israel’s aggression so far. Is it foolish to imagine that European nations and/or Israel’s other trading partners would impose sanctions? According to the Observatory of Economic Complexity, the top export destinations for Israeli products are the United States ($24B), China ($3.25B), Hong Kong ($2.89B), Palestine ($2.86B) and India ($2.13B). Israel imports the most products from the United States ($8.56B), China ($5.86B), Switzerland ($4.05B), Germany ($3.8B) and Belgium-Luxembourg ($3.44B). We can of course forget the US because the Zionist lobby bushwhacks even the mention of sanctions, and both China and Hong Kong have quietly warm relations with Israel based on expanding trade relations. In April 2017, the South China Post reported that officials of Israel and Hong Kong had been meeting “to further strengthen economic ties,” including Israel’s “participation in Beijing’s belt and road initiative to revive land and maritime trade along the old Silk Route.” China is also known for sticking to business rather than politics, but that doesn’t mean it’s beyond grandstanding. In December 2017, The Diplomat reported that “China Vows to Play an Active Role in Settling the Palestine-Israel Issue,” but all that meant was that they’d just held a symposium about it in Beijing, as they did in Beijing in 2003 and Jerusalem in 2006. Palestine needs another symposium like it needs another investigation or another Operation Protective Edge. This is all grandstanding on the international stage as a slow-motion genocide continues, and India joins in too. Time for India to Play a Role in Israel-Palestine Peace?, another Diplomat essay, says that India depends on Iranian oil, and buys 40 to 45 percent of Israel’s defense exports, but that “Indian foreign policy is also driven by a need to increase global standing and prestige. Palestine-Israel, being the world’s most high-profile conflict, provides ample opportunity for New Delhi to present its credentials as a global leader, and compete with China as a champion of the developing world.” How much more shamelessly, cynically self-serving could a nation get? That leaves Palestine, Switzerland, Germany, and Belgium-Luxembourg as Israel’s other most significant trading partners. Israeli exports $2.86 billion worth of products to Palestine, but we can forget about any sanctions coming from that helpless direction. Germany, Switzerland, and Belgium-Luxembourg together export roughly $11.4 billion worth of products to Israel, roughly $3 billion more than the United States and conceivably enough to make Israel uncomfortable if they imposed sanctions. However, calls for the protection of human rights or stopping genocide typically mask the concerns of global corporations, which have little to gain in Palestine. In 2003, France and its dashing Foreign Minister Dominique de Villepin appeared heroic for refusing to join the US and UK in the Iraq War and voting against it on the UN Security Council. However, according to oil expert Antonia Juhasz, France had ulterior motives; Saddam Hussein had in fact agreed to open Iraqi oil fields to French, Russian, and Chinese corporations, but not to those of the US and UK. Optimism is hard to muster, but cynicism is a dead end. There ain’t no power like the power of the people, and the power of the people don’t stop—if it can get organized and call out all this grandstanding for what it is. Palestine is the one cause I know of that can turn out huge crowds all over the world, as it does every time Israel starts “mowing the lawn” in Gaza again. Ann Garrison is an independent journalist based in the San Francisco Bay Area. In 2014, she received the Victoire Ingabire Umuhoza Democracy and Peace Prize for her reporting on conflict in the African Great Lakes Region. By Ziad Hafez*, Contemporary Arab Affairs, The Levant News — Many ask about the role of the United States in the creation of Israel. The book under review provides an unequivocal answer: the United States was instrumental in the creation of a Jewish state in the Arab lands of Palestine at the expense of its inhabitants who were there for centuries. Yet, the book shows how pro-Israel American Zionists have manipulated the government, the media to promote the interests of Israel at the expense of the interests and ideals of the United States. The book sheds a new perspective unknown to many about the manipulations of the pro-Israel group in the United States and Great Britain. It is a ‘must read’ for the general reader as well as for the scholar. None of the established book publishers in the United States is publishing the book under review. Its copyrights are the property of the author Alison Weir, the Executive Director of an organization called “If Americans Knew.org”, or “What every American needs to know about Israel/Palestine”. The organization has its logo on the book’s spine and back cover. The low price is an indication that the publishing organization does not have the same overhead costs of established publishing houses! The author is also the President of another organization called the Council for National Interest (CNI), an organization founded by two former US Congressmen Paul Findley and Paul McCloskey. Both organizations are devoted to the advocacy of a US foreign policy in the Middle East consistent with American interests and not those of a foreign power, i.e. Israel. The contents of the book are probably the reason why no book publisher in the United States would consider publishing it because of the explosive and meticulously documented information about the duplicity and outright illegal if not criminal behavior of the Zionist movement in the United States, Europe, and of course Palestine. The book was originally a paper to set the record straight about the US-Israel relationship (p .iii). However, “the article grew longer and longer as [she] realized how much there was to be explained” (p. iii). As she received more information that needed confirmation and as further research confirmed such received information and uncovered more facts “the article became a book” (p. iii). The gist of the argument developed in the book is that the pro-Israel movement in the United States “has promoted policies that have exposed Americans to growing danger, and then exaggerated this danger (while disguising its cause), fueling actions that dismember some of the nation’s most fundamental freedoms and cherished principles” (p. 2). She tersely adds, “All this for a population that is considerably smaller than New Jersey’s” (p. 2). It is a short book covering sixteen chapters and a preface. Its 241 pages include 94 pages of text, and surprisingly 109 pages of endnotes, a bibliography of 24 pages, an extra list of readings not necessarily quoted in the book (3 pages), and 10 pages of ‘index’. Yet, this short book is quite powerful and displays historical accounts and analyses supported by a solid documentation showing scholarly knowledge and objective reporting. Again, this reviewer vents his frustration to see ‘endnotes’ at the end of the book instead of ‘footnotes’ at the end of each page. In this particular instance, the reader who may resent the ‘back and forth’ between the text and the notes may miss crucial information and sometimes true gems. The bibliography used by the author is quite impressive. Of particular importance is the use of American Jewish scholars, American Zionists, and Israeli scholarship to document the author’s work. The reader will learn many facts buried in obscure books as well as in known works such as biographies of prominent Zionist figures, memoirs of political leaders, and scholarly work recognized internationally. This reviewer was surprised to learn about the collusion between Zionist leaders in Palestine and the United States with Nazi figures before and during World War II (chapter 6). In particular, the cynicism demonstrated by Zionist leaders in preventing President Roosevelt and other Western leaders from providing safe havens for fleeing Jews from countries under Nazi control is particularly horrifying (p. 29). They deliberately sought the sacrifice of Jews in order to use it as a moral blackmail over Western leaders in the promotion and protection of Israel. Quoting journalist Erskine B. Childers in The Spectator in 1960: “One of the most massively important features of the entire Palestine struggle was that Zionism deliberately arranged that the plight of the wretched survivors of Hitlerism should be a ‘moral argument’ which the West had to accept” (p. 30)! The book is targeting an American readership. It is part of an effort to educate the American public about the lies and deception by American Zionists and advocates of Israel, within Congress, in the media, and in academia, and how the United States of America were used to create Israel. Yet, its scholarly content makes it an indispensable tool for any researcher on the root cause of Middle Eastern turmoil. The author has extensively researched the history of Zionism in the world in general and in the United States in particular. Its main strength is the absence of any anti-Semitic streak or references that will make it hard for pro-Israel sympathizers to attack. This reviewer considers this book more effective and persuasive than the seminal work of Stephen Walt and John Mearsheimer about the Israeli Lobby (2007). The author starts by making the argument that American Zionists made their mark first by pushing the United States of America to participate in World War I, even though that “most analysts consider WWI a pointless conflict that resulted from diplomatic entanglements rather than some travesty of justice or aggression” (p. 15). The United States joined this unnecessary war “a few years into the hostilities, costing many American lives, even though the U.S. was not party to the alliances that had drawn other nations into the fray” (p. 15). The author states unequivocally that “diverse documentary evidence shows that Zionists pushed for the US to enter the war on Britain’s side as part of the deal to gain British support for their colonization of Palestine” (p. 16). The author notes that the Americans had strongly opposed entering the war and that President Woodrow Wilson had won the presidency with slogan “he kept us out of war” (endnote 60 quoting the White House archives). It is eerily resembling President Obama’s promise of withdrawing from military confrontations in the Middle East and not embarking upon new wars, and yet here we are facing a creeping military involvement in Syria and Iraq and God forbid with Iran, to the benefit of Israel! Zionist endeavors to push the United States into war is because “from the very beginning of their movement, Zionists realized that if they were to succeed in their goal of creating a Jewish state on land that was already inhabited by non-Jews, they needed the backing from one of the ‘great powers’” (p. 16). Hence, having the United States siding with Great Britain in World War I would achieve their goal of having Great Britain supporting Zionist efforts. This is the essence of the efforts leading to the Balfour Declaration. The author adopts a historical as well as an analytical narrative describing succinctly yet effectively the rise of the American Zionist lobby. It sheds light on the role of Max Norday, Louis Brandeis, and Felix Frankfurter among others in establishing, structuring, and promoting Zionism among American elites. At first, American Jews were not particularly impressed by Zionism and felt their loyalty was primarily to the United States. Quoting Zionist leaders who decried what they considered a problem with American Jews: “The American Jew thinks of himself first and foremost as an American citizen….Loyalty to America is now the supreme watchword” (p. 36 and endnote 145). Having established the lobby and having succeeded in enrolling American Jews by means of indoctrination, cajoling, and threats the various Zionist organizations in the United States went out to establish a firm grip on US media. Quoting Richard Stevens, the author states: “Zionists early on learned to exploit the essential nature of the American political system that policies can be made and un-made through force of public opinion and pressure. Procuring influence in the media, both paid and unpaid, has been a key component of their success” (p. 85 and endnote 340). The author devotes the last chapter narrating the demise of America’s most famous female journalist Dorothy Thompson who valiantly tried in the late forties to tell Americans about Palestinian refugees (chapter 16). The endnotes have fascinated this reviewer. Indeed, there are true gems of information that could have been part of the main text. Yet, the text in its present form makes its arguments quite straightforward. Endnotes are used to flesh out the narrative with many scholarly quotes and sometimes not well-known pieces of information. Among the endnotes that caught the reviewer’s attention endnote 69. Quoting William Yale, the author of The Near East: A Modern History. Yale, a descendant of the founder of the Yale University, was an authority of the Middle East. He had worked with the State Department in a number of roles in the Middle East including as a member of the King Crane Commission (p. 124). Yale writes: “ the Zionists in England set about winning British support for Zionism….The methods by which the conquest of the British government was made were diverse and of necessity in some cases devious” (p. 124). As the Allied cause in 1916 was far from bright, and quoting Zionist leaders, the latter worked to persuade British officials that “the best and perhaps the only way (which proved to be so) to induce the American President to come into the war was to secure the cooperation of Zionist Jews by promising them Palestine, and thus enlist and mobilize the hitherto unsuspectedly powerful forces of Zionist Jews in America and elsewhere in favor of the Allies on a quid pro quo contract basis. In other words, an unnecessary war gone badly required the intervention of the United States in order to secure the support of the British government in establishing a Jewish state in Palestine. Another interesting endnote is endnote 197 where the author quotes history professor Lawrence Davidson about Clark Clifford’s commitment to Zionism. It is part of a section in chapter 8 where the author indicates how State Department officials opposed the pro-Israel movement and how Clifford circumvented them. The latter justified his sympathy toward the plight of Jews as part of his ‘humanitarian’ make up! Yet, Davidson doubts that “given Clifford’s uncaring attitude toward the United States’ diplomatic staff in the Middle East, it is hard to believe that he was much moved by high principle. More likely, his decision to back a Zionist state in Palestine, with all its violent and destabilizing consequences for millions of people, was made simply on the basis of its ability to help forward the political ambitions of the man he worked for [Truman]” (p. 161). The book has focused on the development of Zionism in the United States. The book would have gained even more weight had the authors listed the disastrous effects of American unilateral alignment with Israel. Indeed, such policies have been detrimental to the Arabs in general and Palestinians in particular but also to the ideals and interests of the United States. However, this may be the subject of another book. Mearsheimer, John, J. and Walt, Stephen, M. The Israeli Lobby and US Foreign Policy, New York, Farrar, Strauss, and Giroux, 2007. Yale, William, The Near East: A Modern History, Ann Arbor, University of Michigan Press, 1968. *Ziad Hafez is General Secretary for the Arab National Conference, the leading Arab nationalist organization. A leading intellectual with a background in economics, political science, law, and university teaching, Hafez is the author of numerous books and articles in Arabic, French, and English. This review was first published in Contemporary Arab Affairs, a quarterly journal issued in London by Taylor and Francis and sponsored by the Center of Arab Unity Studies. It was also distributed by Al-Hewar Center. Related: More reviews of Against Our Better Judgment are on the book website.